Influence of fossoriality on inner ear morphology: insights from caecilian amphibians. Evolution of cranial shape in caecilians (Amphibia: Gymnophiona). A new species of striped Ichthyophis Fitzinger, 1826 (Amphibia: Gymnophiona: Ichthyophiidae) from Myanmar. Discovery of a new family of amphibians from northeast India with ancient links to Africa. - read about it on the BBC news, watch video about the discovery here. A new species of Rhinatrema Duméril & Bibron (Amphibia: Gymnophiona: Rhinatrematidae) from Guyana. Out on a limb: bandicoot limb covariation suggests complex impacts of development and adaptation on marsupial forelimb evolution. The genetic architecture of fluctuating asymmetry of mandible size and shape in a population of mice: another look. Adult frogs and tadpoles have different macroevolutionary patterns across the Australian continent. ​Phylogenetic convergence and multiple shell shape optima for gliding scallops (Bivalvia: Pectinidae). Semicircular Canals In Anolis Lizards: Ecomorphological Convergence And Ecomorph Affinities Of Fossil Species. Getting a head in hard soils: Convergent skull evolution and divergent allometric patterns explain shape variation in a highly diverse genus of pocket gophers (Thomomys). Blog post summary by Matt Wedel. 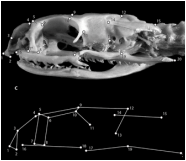 Are Diet Preferences Associated to Skulls Shape Diversification in Xenodontine Snakes? Amber fossils demonstrate deep-time stability of Caribbean lizard communities. - read about it on New York Times Online, Smithsonian Science News, ABC Science Online, Harvard Gazette, CBC News. Do cladistic and morphometric data capture common patterns of morphological disparity? A relative shift in cloacal location repositions external genitalia in amniote evolution. View the Morphobank images here. Is it a snake? Is it a worm? No it's a caecilian! Biological Science Review - A magazine for A-level students of Biology 2012. - Book review of Horseshoe Crabs and Velvet Worms The Story of the Animals and Plants That Time Has Left Behind by Richard Fortey. New Generation Curation! Digital Specimen archiving my micro-CT. Sherratt, E. (2009) Annual Report of the Department of Zoology 2008-2009. Edited by C. Patterson, The Natural History Museum, London.